5/20/17: All supers very full. Added 5th super. Lots of SHB, added 2 SHB traps to try and catch some. 40lb increase since previous measurement. 4/30/17: Getting hot out, but very dry. Still, a big 26lb increase since previous measurement. Lots of honey starting to go into upper supers. 4/8/17: Had enough time to do a full inspection and weigh in. Weight is moving around, but up 10 pounds from last time. Starting to draw out 4th super. 3/31/17: A quick trip out to see that a lot of activity was happening, better add another super just to make sure they don’t fill up. 3/12/17: We have been neglectful, but the girls have been busy! They are full up everywhere and the population is gangbusters. Starting to see queen cups. We cut them and added another super. Small weight loss, but there was hardly room for honey around all the brood. 2/10/17: Apiary inspection with our new state bee expert! It went well, the girls got a clean bill of health. 12/24/16: Old comb still getting used some, we should harvest this. Nice weight increase for it being winter. 11/20/16: They are abandoning the old comb a bit and using the new frames in super 2. multiple full frames in super 2 (frames 2 and 8). Might harvest the wax and honey in the lower section soon, replace old comb with foundation. 10/23/16: Not much weight addition. Some due to the hurricane and cooler weather. Lots of brood ready to pop. Some torn open cells, but a 24 hour mite board looked very clean. 9/30/16: Had a journalist student come by and do an interview while we inspected the hive. Lots of growth, honey storage and larva!!! 13 pounds increase since last inspection! 9/18/16: First inspection of the hive in its new home. Very good progress has been made in fusing the cut out comb with the wooden frames. First weigh in. 8/28/16: We went ahead and cut the bees out of the owl box. They looked good, and had the box completely full of comb. It all fit inside a single medium super. Decent number of SHB. 7/17/16: Still no expansion into first super. Owl box very heavy! 7/4/16: No weight check, but the bees are finally starting to be very active in the lower chamber. Hopefully they will setup shop there so we can remove the owl box. 5/25/16: Rescued a hive setup in a screech owl box. 3/27/16: More weight loss. Number 3 and 4 are pretty full of brood, so populations will continue to rise. Some evidence of mite loading. Deformed wings and such, may have to treat soon. 2/28/16: Continued loss of weight, but tons of pollen in the hive and a lot of new brood going down. Weather has been finicky, but is starting to stabilize to spring. 1/30/16: Another hive adventure with a few more newbees. We got to see multiple new girls emerging!!! Lots of good activity, but weight is still down. Weather had been quite cold. 1/9/16: Slight decrease in weight again. Lots of activity, but there must not be enough blooming. Weather has been warm, highs between 70s and 80s. 12/12/15: Invited a few people from the bee group to do an inspection, it went well. Plenty of brood and activity in the hive. Weather has been mid to upper 70s. Hive weight holding steady, honey moving out of the brood, and into uppers. 11/28/15: Our setup of this hive has been 1,4,3,2 from bottom to top. Good brood laying and lots of activity. They are slowly moving honey out from the bottom to the top. 11/15/15: Small increase, they are doing well and slowly moving into the deep. Honey from the deep is moving up to number 3. 10/25/15: Another big increase. Some larva and capped brood. Also many queen cells. I guess we have a live queen, but I am just going to let it all roll and see what happens. 10/18/15: 10lb increase! lots going into the deep as honey. Curiously there is very little capped brood. Hard to say what is happening. 10/11/15: First inspection with new bees. Current setup is 2 on top, 3, deep, then 4 on bottom as the nuc. Lots of honey going into the deep. Supers are cleaned up and getting recapped. 10/8/15: SHB larva infested frames removed and frozen. New nuc of russian bees added to remaining deep frames along with supers. Very active group of bees! 10/8/15: Colony is lost. No survivors, SHB larva beginning its work on the left over stores. Luckily we incorporated a new nuc. Ester is reborn as Ester II. 10/3/15: Queen Ester is dead. Almost no capped brood an no larva. Very low population 500-1000?. We harvested the honey and got 37lbs. A local keeper has a nuc for us so hopefully we can repopulate before winter. 9/27/15: More decline across the board. It has finally stopped raining. Started feeding Friday, and will continue to feed until weight stabilizes. Continued issues with bloated brood. 9/20/15: Another decline, lots of bloated brood. Very rainy week. It has been very wet for over a month. 9/13/15: Slight decline in weight again. Still not sure what the issue is. Now powder this time. 9/7/15: Microfiber SHB trap had limited effect. Total weight was finally positive, they seem to be slowly pulling honey from high to store down low. Repeated powder treatment. 8/31/15: Another decrease in weight, but most of the new frames in #3 are drawn out now. Did another powder treatment. Added microfiber pad for SHB. 8/23/15: Slight weight decrease, and no new comb drawn. I wonder if mites are to blame? We did a powdered sugar treatment, will continue for a few weeks with monitoring. 8/16/15: Did mini extraction, pulled 5lb out of super #4. 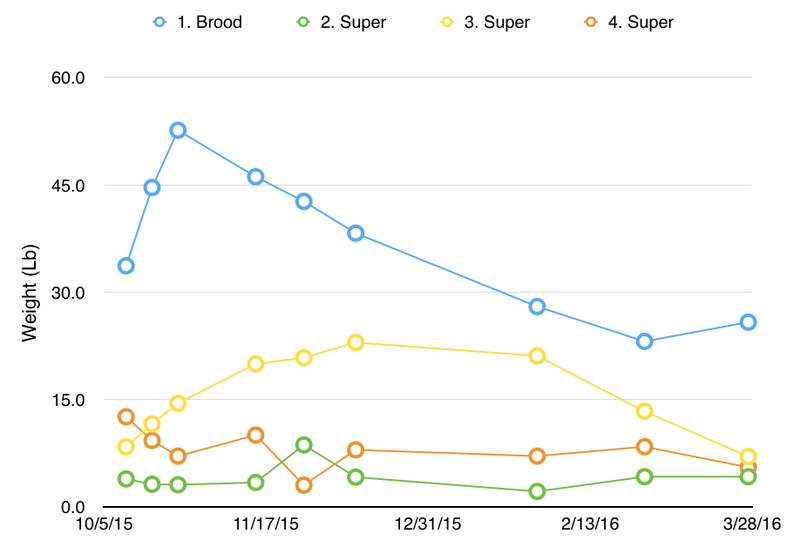 Moved super 4 closer to deep in hopes of increased utilization. Lots of rain recently. 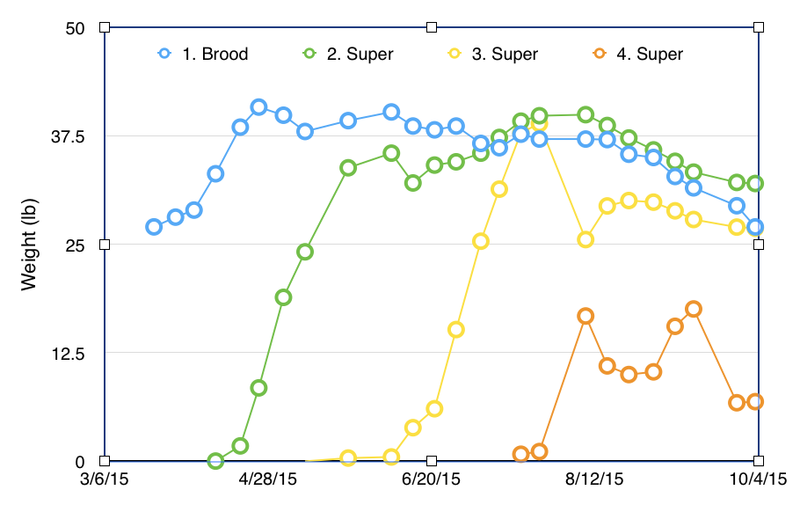 8/9/15: Super 4 had little activity on new frames, but 3 had lots. Maybe place new supers on lowest area first. 7/25/15: 2lb increase, still little drawing in top super. Began heavy checker-boarding between 3 and 4. 7/19/15: 4-5mites per day. Looks like having trap out while inspecting caused more mites to drop. Not much happening in the new super, but 2 and 3 are full! 7/14/15: Sticky board under hive shows ~12 mites per day. Trap out while we did inspection. Did that cause more mites? 6/21/15: 4lb increase. The syrup spray worked well, lots of storage in top super. Only 1 SHB spotted. 6/14/15: No weight increase, but they started drawing comb on sprayed frames. Sprayed frames 7-9 with syrup. 6/9/15: Looked for comb on top super, saw little activity. Sprayed frames 2-6 with 1:1 syrup to try and encourage acceptance. 6/7/15: No weight increase, and no activity in the upper super. We switched a few frames between 2 and 3 to see if that helps. about 20 beetles up top, smashed most, trap empty. 5/31/15: Pulled my first mite trap in. Rate: 1 mite per day. 5/29/15: State inspector came by. The girls passed with flying colors. She had lots of small suggestions and tips, what a great visit! 5/25/15: No activity in super #3. Hive beetle pop increase, adding SHB trap. Second super becoming very full. 5/10/15: 6.5lb increase, two days of mixed weather with rain. Added additional super, first super contains lots of capped honey. 5/3/15: Over 8lb this week, one afternoon of rain. Super frame 3-9 filling with honey, some capping. 4/25/15: 5+ lb added, light rain. Frames 3-7 have drawn comb in the super. 4/11/15: Deep utilization 80-90%. Didn’t have enough smoke and dropped a frame. You need good smoke every time. Big weight increase and added a super. 4/4/15: Deep utilization 70%. 1, 10 and half of 2 and 9 not touched. Big weight increase! No rain this week, very hot/dry. 3/29/15: Good inspection, found the queen! Post. Some rain and cold this week. 3/22/15: Inner side of frame 3 and 9 very full of comb and nectar. 3/14/15: First inspection. Lots of larva, new honey cells being filled, frame 3 (new) has lots of drawn comb. 3/11/15: Number of foragers coming back with Pollen Pants has gone from 20% (day 2) to nearly 80%. They are tapping into the local resources! 1/31/15: Stuff has started coming in. I sealed the outside of all woodenware parts. 1/28/15: Ordered basic hive components, safety gear and tools. No bees ordered yet, waiting to get everything setup first. January 2015: We decide to have bees!